"Hello, my name is Tirana", an exhibition of 40 black and white photographs reflecting the history and culture of the Albanian capital was opened in Bucharest, Romania. The exhibition comes in the framework of reciprocal exchanges between the two countries and aims at presenting the cultural anthropology and historical memory of Tirana. 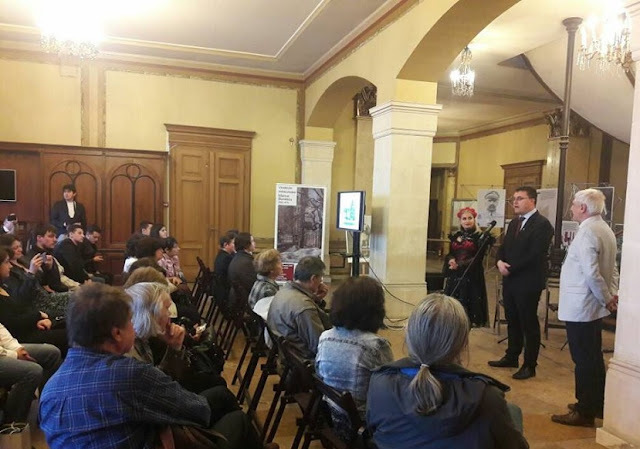 This exhibition was organized by the National Museum of History and Bucharest Museum and is opened a few days ago for the visitors in the Sutu Palace in Bucharest. It is described as a special exhibition, which through a panorama of 40 frames, makes it known to anyone the history of a capital. But this time this is mostly the case for the citizens of Bucharest. The public of the Romanian capital, but beyond that, will have the opportunity to recognize different aspects of the development of the largest city of Albanians, through images of infrastructure, urban development, and the ethno-cultural side of Albanians. Everything has to do with a panorama where the white and black picture stands out, extracted from the time peliculas. And the first photo dates back to 1920, exactly when in the Lushnja Congress, Tirana was declared the capital of Albania. The opening ceremony was attended by the Director of the National History Museum, Dorian Koci, the Ambassador of the Republic of Albania in Romania, Ilir Tepelena, the Bucharest Museum Director, Prof. dr. Dr. Adrian Majuru, as well as many personalities of the Bucharest Municipality and Romanian art and culture. Also before the opening of the exhibition was a concert with the special participation of soprano Arlinda Morava and Ensemble of the Arts University in Tirana, directed by maestro Lorenc Radovani. The music selected by well-known Romanian authors and Korça civic songs constituted the repertoire of this concert, which made the spectator on the plate applauding strongly for the mastery of the soprano.